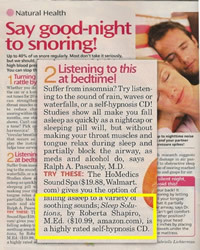 Roberta's CD from "The Calming Collection: Sleep Solutions" was featured at the Woman's World Magazine in April of 2008 and April of 2009. 2- Listening to this at bedtime! ... "Sleep Solutions, by Roberta Shapiro, M.Ed. ($10.99, www.amazon.com)", is a highly rated self-hypnosis CD. 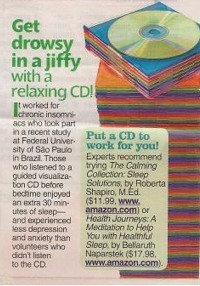 Get drowsy in a jiffy with a relaxing cd! It worked for chronic insomniacs who took part in a recent study at Federal University of Sao Paulo in Brazil. Those who listened to a guided visualization CD before bedtime enjoyed an extra 30 minutes of sleep - and experienced less depression and anxiety than volunteers who didn't listen to the CD. Put a CD to work for you! "Experts recommend trying The Calming Collection: Sleep Solutions, by Roberta Shapiro, M.Ed. ($11.99, www.amazon.com)".